054.Andrea Polli – JavaMuseum 2010 – Celebrate! 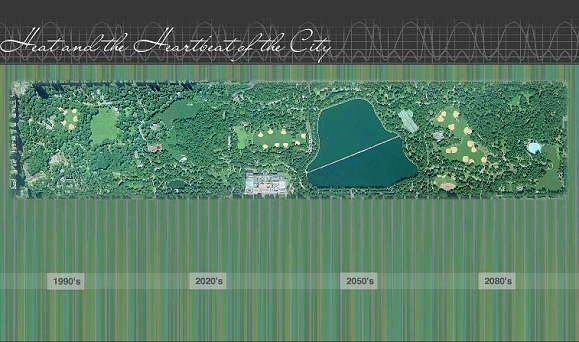 Heat and the Heartbeat of the City: Central Park Climate Change in Sound According to a 1999 report published by the Environmental Defense Fund, New York City will be dramatically impacted by global warming in the near future. Metropolitan East Coast Assessment, the impacts of these changes on this major metropolitan area will be great. these dramatic changes focusing on the heart of New York City and one of the city’s first locations for climate monitoring, Central Park. As you listen to the compositions, you will travel forward in time at an accelerated pace and experience an intensification of heat in sound. The data sonified is actual data from summers in the 1990’s and projected data for the summers of New York in the 2020’s, 50’s, and 80’s using an atmospheric model of the city that is one of the most detailed models of any urban area. All data has been formatted especially for the creation of sonifications.